The Watson House built in 1898 has been recently renovated with Victorian charm. Six guest rooms, all with private baths some with jacuzzi's, are tastefully decorated with antiques, wicker, and nostalgic pieces. Each room has a ceiling fan and air conditioning. We have bikes, beach chairs and towels to take to the Chincoteague National Wildlife Refuge, Assateague National Seashore, where you can enjoy numerous nature trails, guided tours, crabbing, fishing, clamming, and swimming. Mingle with our guests over a hearty full breakfast in our dining room or on the verandah. Call for current rates. 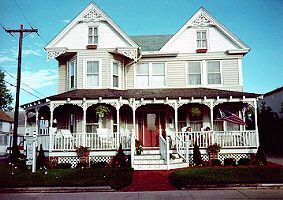 In season bed and breakfast rates are Memorial Day Weekend to Labor Day Weekend. We are closed after Thanksgiving Weekend to the end of March. Minimum stay of 2 to 3 nights required on weekends and holidays. Ten Day cancellation is required. We welcome children 10 and over. No Pets allowed. Smoking permitted on verandahs only.